The ESOcast Light is a series of short videos bringing you the wonders of the Universe in bite-sized pieces. The ESOcast Light episodes will not be replacing the standard, longer ESOcasts, but complement them with current astronomy news and images in ESO press releases. Credit: ESO. Footage and photos: ESO, G. Hüdepohl (atacamaphoto.com), DSS, N. Risinger (skysurvey.org), M. Kornmesser. 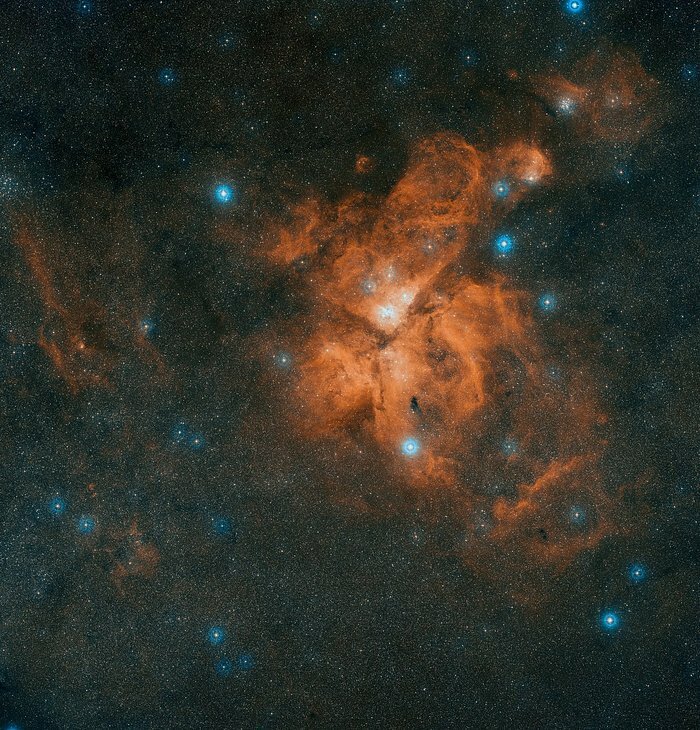 Within this intriguing nebula, Eta Carinae takes pride of place as the most peculiar star system. 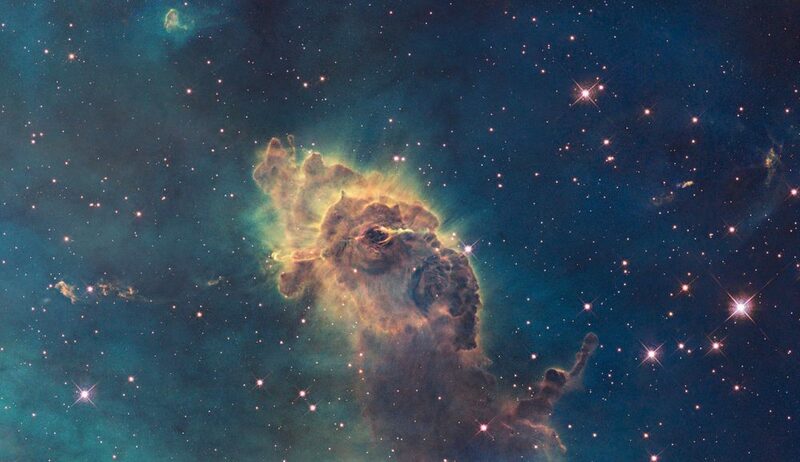 The Carina Nebula (catalogued as NGC 3372; also known as the Grand Nebula, Great Nebula in Carina, or Eta Carinae Nebula) is a large, complex area of bright and dark nebulosity in the constellation Carina, and is located in the Carina–Sagittarius Arm. The nebula lies at an estimated distance between 6,500 and 10,000 light-years (2,000 and 3,100 pc) from Earth. This stellar behemoth — a curious form of stellar binary— is the most energetic star system in this region and was one of the brightest objects in the sky in the 1830s. It has since faded dramatically and is reaching the end of its life, but remains one of the most massive and luminous star systems in the Milky Way. Colour-composite image of the Keyhole, a dark nebula within the Carina Nebula. The Carina Nebula was discovered from the Cape of Good Hope by Nicolas Louis de Lacaille in the 1750s and a huge number of images have been taken of it since then. But VISTA — the Visible and Infrared Survey Telescope for Astronomy — adds an unprecedentedly detailed view over a large area; its infrared vision is perfect for revealing the agglomerations of young stars hidden within the dusty material snaking through the Carina Nebula. 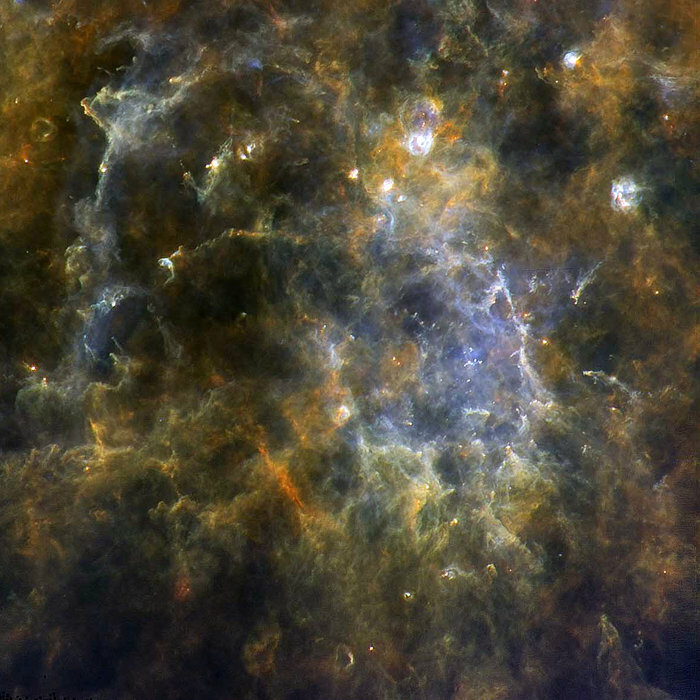 In 2014, VISTA was used to pinpoint nearly five million individual sources [Astronomy and Astrophysics] of infrared light within this nebula, revealing the vast extent of this stellar breeding ground. 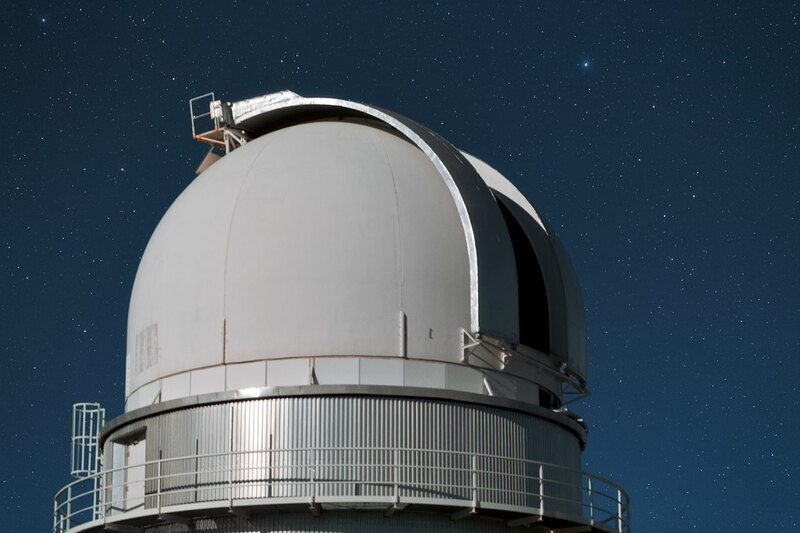 VISTA is the world’s largest infrared telescope dedicated to surveys and its large mirror, wide field of view and exquisitely sensitive detectors enable astronomers  to unveil a completely new view of the southern sky. The incredibly luminous massive star Eta Carinae has long posed a challenge for astronomers to model. New observations are now in … so were our models correct? The massive evolved star Eta Carinae, located ~7,500 light-years away in the constellation Carina, is the most luminous star in the Milky Way. 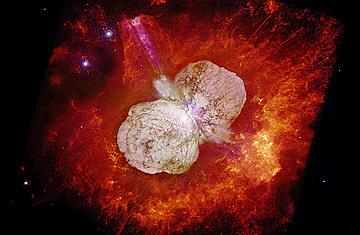 Eta Carinae has a quite a reputation for drama: it has been very unstable in the past, exhibiting repeated eruptions that have created the spectacular Homunculus Nebula surrounding it. Its present-day wind has the highest mass-loss rate of any hot star we’ve observed. In our goal to understand the late evolutionary phases of very massive stars, we’ve developed radiative-transfer models to explain the behavior of Eta Carinae. 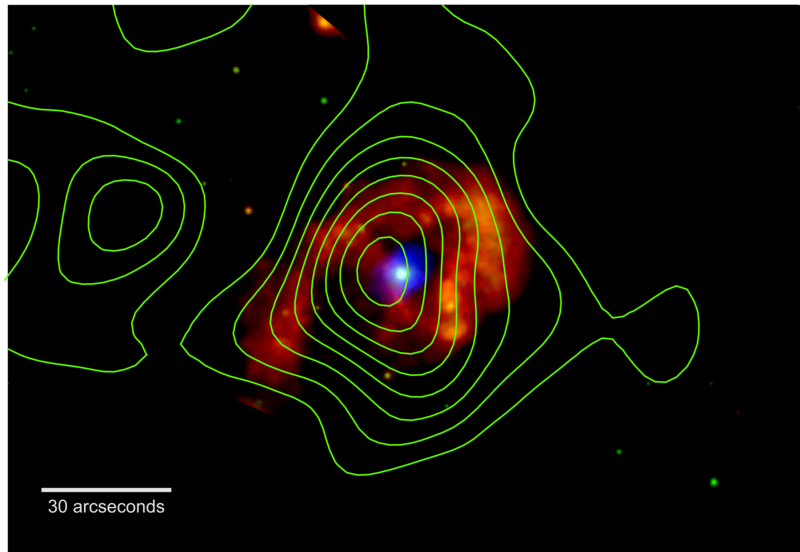 One of the most well-known models, developed by John Hillier and collaborators in 2001, describes Eta Carinae’s mass loss via stellar winds. With the right observations, this model is testable, since it predicts observable locations for different types of emission. In particular, one prediction of the Hillier et al. model is that the dense, ionized winds surrounding the star should emit in H-alpha at distances between 6 and 60 AU, with a peak around 20 AU. This nicely testable hypothesis is rendered less convenient by the fact that it’s hard to get resolved images of Eta Carinae’s H-alpha emission. Its distance from us — and the fact that it’s shrouded in the complex nebula it created — have thus far prevented us from resolving the H-alpha emission from this star. Now, however, a team of scientists from Steward Observatory, University of Arizona have changed this. Led by Ya-Lin Wu, the team obtained diffraction-limited images of Eta Carinae using the Magellan adaptive optics system. The observations, made in both H-alpha and continuum, show that the H-alpha emitting region is significantly wider than the continuum emitting region, as predicted by the model. In fact, the measured emission implies that the H-alpha line-forming region may have a characteristic emitting radius of ~25–30 AU — in very good agreement with the Hillier et al. stellar-wind model. This confirmation is strong support of the physical wind parameters estimated for Eta Carinae in the model, like the mass-loss rate of 10^-3 solar masses per year. These parameters are enormously helpful as we attempt to understand the physics of strong stellar-wind mass loss and the late evolutionary phases of very massive stars. See the full article for further references complete with links. In the early nineteenth century, the binary star system Eta Carinae was weak and undistinguished. In the first decades it became increasingly brighter until April 1843 was the second brightest star in the sky, just behind Sirius (nearly a thousand times closer to Earth). In the years that followed, gradually he eased again in the twentieth century and was completely invisible to the naked eye. Star varying in brightness has continued since then and while once again visible to the naked eye on a dark night has never come close to its peak of 1843. The star system Eta Carinae is a binary system is composed of two stars, the larger of the two stars is a huge and unstable star nearing the end of his life and the events observed by the astronomers of the nineteenth century was a stellar experience near death. Scientists call these outbursts supernova impostor events that appear similar to supernovae but stop just in time to destroy the star. Although nineteenth – century astronomers did not have telescopes powerful enough to see the outbreak of 1843 in detail, its effects can be studied today. Huge clouds of matter thrown a century and a half ago, known as the Nebula Homúncula have been a regular target for Hubble since its launch in 1990. This image, taken with the Advanced Camera for Surveys High Resolution Channel is the most detailed , however, it shows us how the star material was not ejected in a uniform manner but held as a huge dumbbell. Eta Carinae is not only interesting for its past, but also for its future. It is one of the closest stars to Earth is likely to explode in a supernova in the relatively near future (though in astronomical timescales the “near future” could still be a million years). When you do, wait a breathtaking view from Earth, visible only from the southern hemisphere, much brighter even than the latest outbreak observed SN 2006gy , the brightest supernova ever observed coming from a star of the same type. This image consists of visible and ultraviolet images of high resolution channel of Hubble’s Advanced Camera for Surveys light. 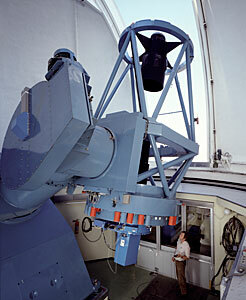 The field of view is about 30 arcseconds. Eta Carinae is located at a distance of 7,500 light-years away in the constellation Carina. Combining images taken with Hubble Space Telescope over more than 20 years, a team of UA researchers has discovered that Eta Carinae, a very massive star system that has puzzled astronomers since it erupted in a supernova-like event in the mid-19th century, has a past that’s much more violent than they thought. The findings help rewrite the story of how this iconic and mysterious star system came to be and present a critical piece of the puzzle of how very massive stars die. By carefully analyzing images of Eta Carinae taken with NASA’s Hubble Space Telescope, Kiminki and her team were surprised to discover that the Great Eruption was only the latest in a series of massive outbursts launched by the star system since the 13th century. Published in the journal Monthly Notices of the Royal Astronomical Society, the paper was co-authored by Nathan Smith, associate professor in the UA’s Department of Astronomy, and Megan Reiter, who obtained her Ph.D. from the same department last year and is now a postdoctoral fellow at the University of Michigan. The original goal of the team’s observing program was to measure proper motions of stars and protostellar jets — fast streams of matter ejected by young stars during formation — in the Carina Nebula, but the same data also provided a powerful way to measure the motion of debris ejected by Eta Carinae itself. Records from the 19th century deepen the mystery, detailing how the star rocketed in brightness in 1838 and again in 1843 when it dazzled as the second brightest star in the night sky before fading away. 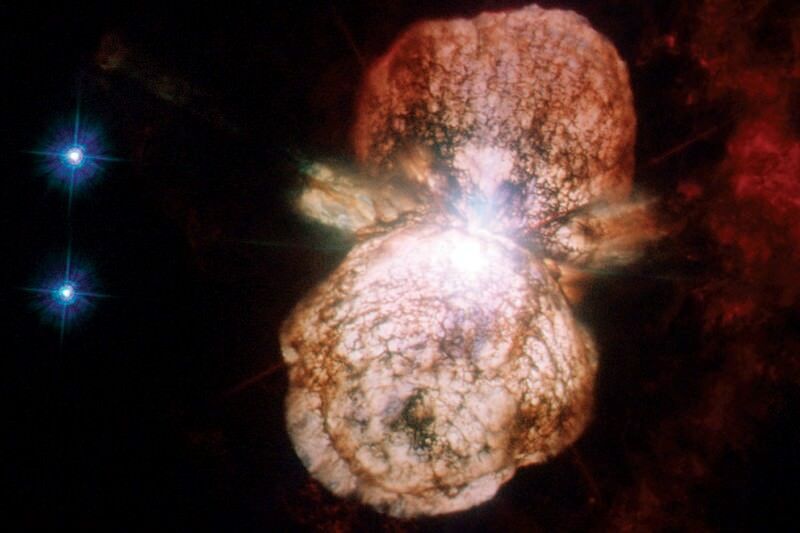 This strange behaviour earned Eta Carinae the label of supernova imposter, because it mimicked the sudden burst of light from exploding, dying stars but did not destroy itself in the process.